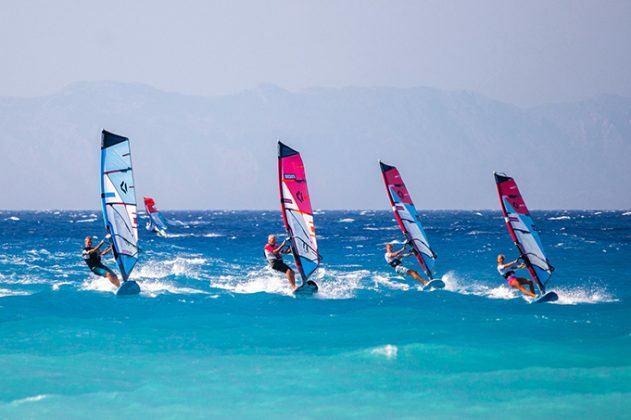 Three top windsurfing centres located in the centre of Ialyssos providing the latest equipment. Known for the Meltemi, a dry, northwesterly wind; the bay also benefits from a local thermal wind with an average wind speed of 16-25 knots. Thermal wind generated from the Venturi effect between the island, Turkey and the hills of Monte Smith. The best conditions are mid-June until mid-September (with a peak of 95% planing days in July/August). Spring and autumn planing days increasing from 60% to 70% until mid-June, then decreasing from 70% from mid-September until 60% by the end of October. Spot 1 – Procenter 1 has more than 180 boards from Fanatic and 200 sails from Duotone Sails. Spot 2 – Procenter 2 is the high-tech centre with more than 70 JP Australia boards and around 100 NeilPryde sails. 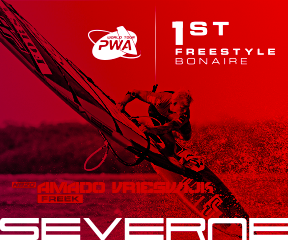 Spot 3 – Procenter 3, the Windmill Center, is equipped with Tabou and Gaastra kit and has perfect conditions for beginners & advanced learners, as the bay is sheltered for the first 100 metres. All 3 centres are situated directly on the beach, less than 30 metres from the water. The Procenter team offer individual and group training, improving your skills in a relaxed and professional environment. Blue Horizon Palm Beach 4* Hotel is right by the centre, on the beach and low budget guests will feel right at home at Procenter’s Surfhouse.